Thanks, Joanne, for a fantastic tutorial. I love Ready, Set, Craft – it’s such a sunny place to hang out. 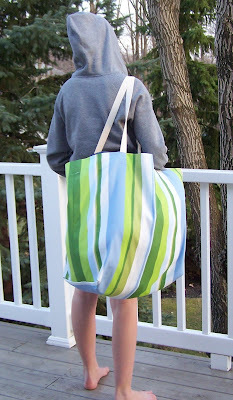 In case you didn’t see it, I posted a tutorial on how to make an over-sized tote on Joanne’s blog. Check it out and get ready for summer! I dug around the craft room and found all the ingredients! Instead of canvas, I thought I’d try my t-shirt scraps. (The uses for my t-shirt scraps never stop!) Plus, since it is soft and stretchy, it would conform to the neck nicely. I also found some scrap flannel to make a pretty pillowcase. Suzannah’s tutorial calls for a 1/4 yard of fabric. I had a little more than 8″ so I thought that would do. 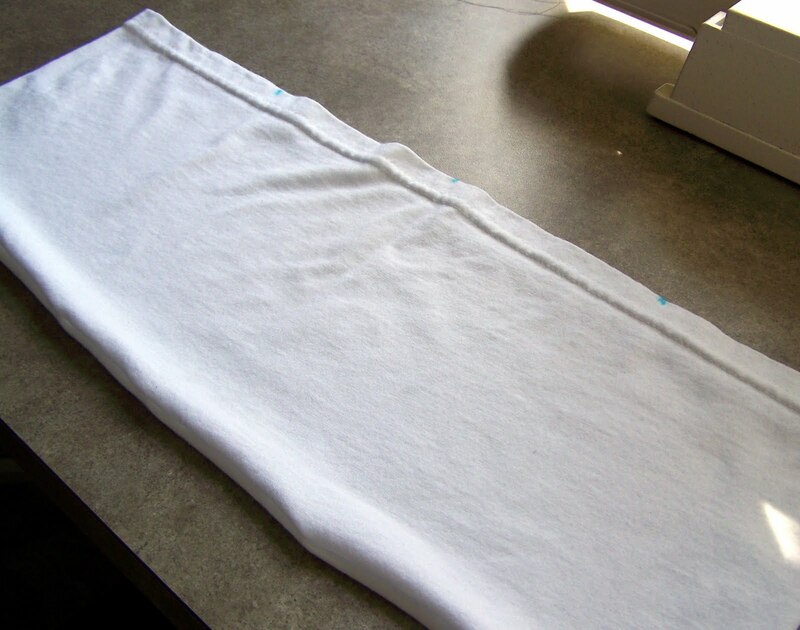 I turned the t-shirt inside out, serged along the cut end and turned it right side out. I measured the 1/4, 1/2, and 3/4 marks and stitched a line at these points to create four chambers. 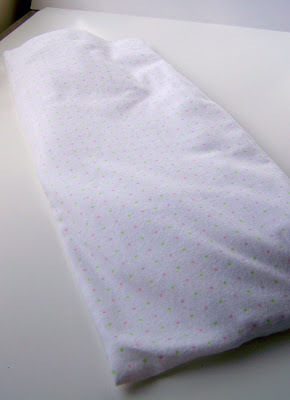 Finally, I made a nice pillowcase out of flannel, making sure that it was slightly wider than the bag. I love that this rice bag has chambers because all the rice won’t flow to the end if you put it around your neck or over your shoulder. Are you crafting up any excitement in anticipation of spring and summer? 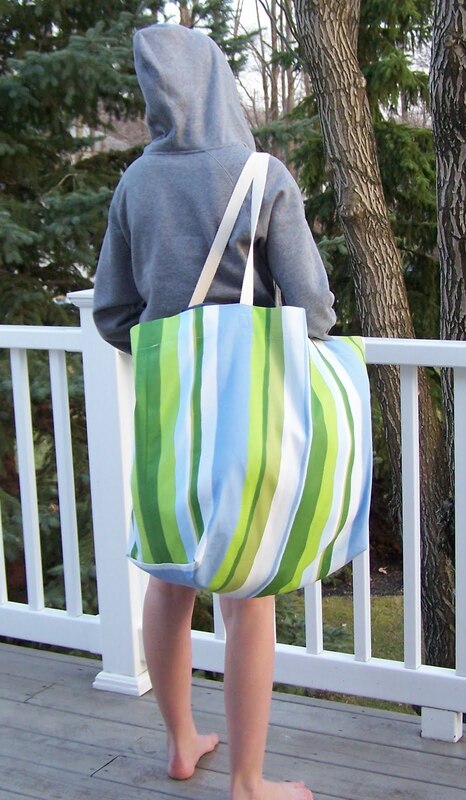 I like that over-sized tote bag, it’s so nice and roomy and the colors are bright and cheerful. 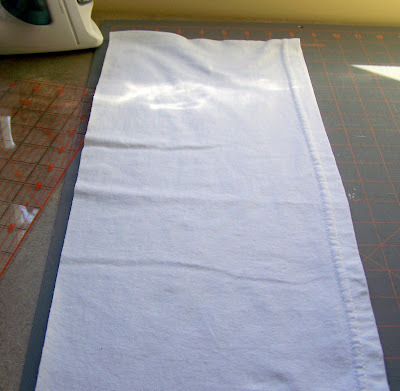 I don’t sew, so when I look at a sewing tutorial all I can think is, wow, that looks really hard. The French Picnic ladies love your creativity! Love that tote, the size and the colors! Great! he looks like he is ready for the beach. And the rice bags, smart idea! Think how much yarn would fit in that tote bag! I love it. Hey, glad you liked the rice bag tutorial!! Thanks for sharing!